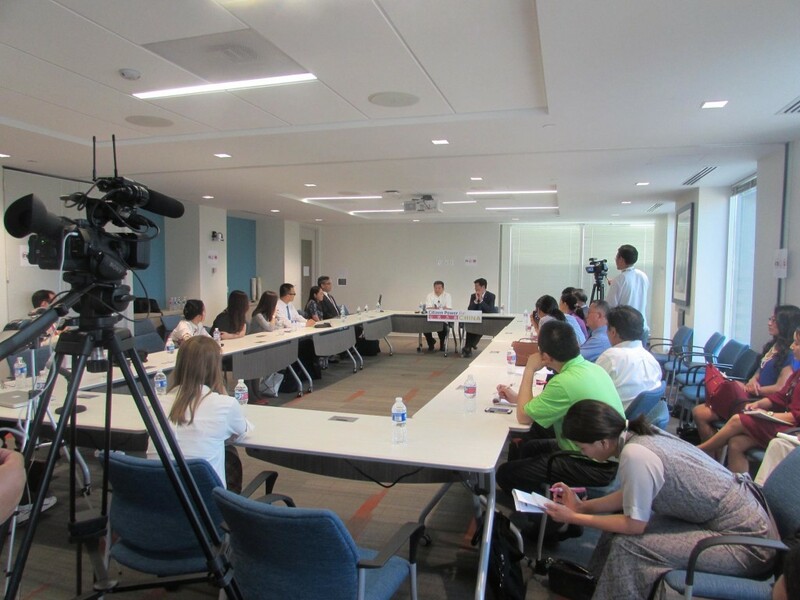 Sikyong Dr. Lobsang Sangay speaking to Chinese scholars and students during a dialogue organised by Initiatives for China in Washington DC, 12 May 2015. 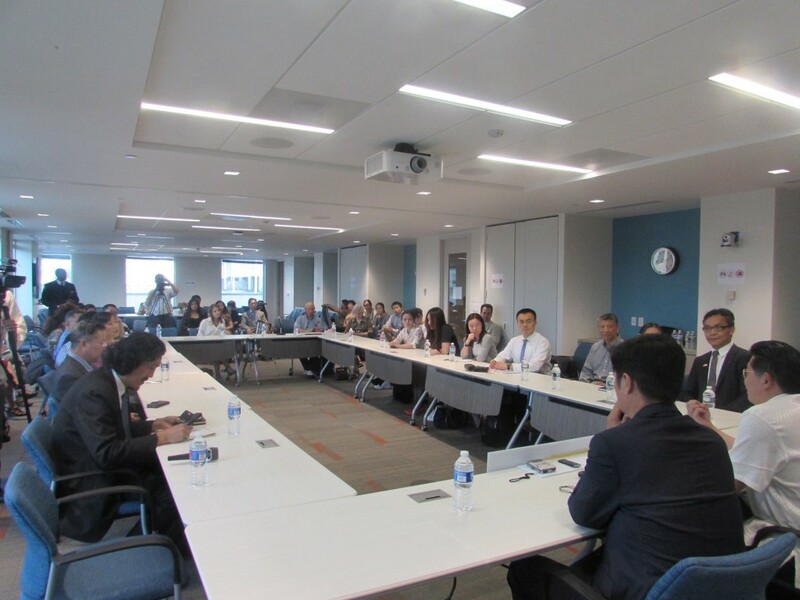 The meeting took place at a dialogue organised by Initiatives for China (IFC), a grassroots movement towards democracy in China, which was moderated by Dr. Yang Jianli, Founder/President of IFC and a fellow Harvard scholar and close acquaintance of Dr. Sangay. Sikyong, in his address to the scholars, underlined the importance of interaction between the Chinese and the Tibetan people to restore the historic trust and friendship shared by the two people. The trust and friendship between the two people has however strained lately as a result of Chinese government’s continued propaganda to create misunderstandings and disharmony, he noted. Without over simplifying the essence of the Tibet issue, Sikyong explained that the Tibet issue could be described in four M’s, as in Mistake, Mistrust, Middle Way and Misunderstanding or Misinterpretation. He said that the occupation of Tibet by the Communist Chinese forces and the continued repression of the Tibetan people by the Chinese government is a mistake. “If you look back in history, at least from Tang dynasty all the way to Qing dynasty to the Kuomintang era, Tibet invaded China at one time and Chinese armies also came to Tibet. But then the Chinese army never stayed in Tibet for this long, the repression has never been this severe, hence I think even from a historical context it is a mistake,” he said. Sikyong reasoned that this mistake is the root that has sown mistrust between the two people. “Instead of redressing the mistake, the Chinese government continued its policies of political repression, cultural assimilation, social discrimination, economic marginalisation and environmental destruction in Tibet which led to the Tibetan people’s mistrust of the Chinese government,” Sikyong said. Sikyong Dr. Lobsang Sangay highlighted the Jokhang temple as the epitome of the mistrust that has prevailed in Tibet as a result of the Chinese occupation and repression. “The Jokhang is the holiest shrine for Tibetan Buddhists. What’s interesting is that, the Jokhang houses a statue of Buddha, which was brought to Tibet by Wencheng, a Chinese princess who married Tibetan king Songtsen Gampo. For centuries, Tibetans have worshipped the temple. However, if you visit the Jokhang now, there are surveillance cameras and sharpshooters perched on rooftops everywhere, which is making the Tibetan people apprehensive about going to the Jokhang now,” he said. “This drastic change in the behavior of the Tibetan people towards the Jokhang begs the question, how did a sacred place of worship turn into a feared police station? Perhaps this is the biggest example of the mistrust between the two people that has risen as a result of the Chinese occupation of Tibet,” Sikyong asserted. Speaking on the Middle Way Approach, Sikyong said that the Middle Way Approach was envisioned by His Holiness the Dalai Lama and implemented by the Central Tibetan Administration to address the enduring mistrust between the two people. “The Middle Way Approach seeks for a genuine autonomy for the Tibetan people within the framework of the Chinese constitution. The Chinese government always allege that Tibetans aim to split the nation, which is why we have taken into consideration not to challenge the sovereignty and territorial integrity of China,” Sikyong explained, adding that this proposal is as reasonable and moderate as one can get to resolve the issue. “However, instead of responding to this proposal positively, the Chinese government has resorted to misinterpretation and misinformation, hence misunderstanding,” Sikyong exclaimed. Sikyong quoted a statement from the recent Whitepaper on Tibet issued by the Chinese government to elucidate his point. “The recent white paper stated that Tibet was part of China since antiquity. However, in 2004, a similar Chinese White paper on Tibet said Tibet was part of China since the 13th century,” Sikyong argued. “But if you go by the writers of the republican era, Tibet became a part of China during the Republican or Kuomintang era. Then again, if you read the 17 point agreement signed by an under duress Tibetan delegation with the Chinese government on 21 May 1951, you will see that the preamble of the agreement say, ‘Tibet shall return to the Motherland’,” Sikyong remarked, arguing that if Tibet was always a part of China, where was Tibet returning from? “There are a lot of contradictions in the Chinese government’s narrative on Tibet.,” Sikyong said. To buttress his case, Sikyong recalled a reputed Chinese historian from Fudan University, who sits on the advisory board of the Communist party, who has said that China cannot claim Tibet as a part of China since antiquity, as Tibet was a sovereign nation during the Tang dynasty. He also asserted that the recent white paper on Tibet was a deliberate attempt by the Chinese government to misinterpret and mislead the world. “The white paper’s allegation on the Middle Way Approach has less relevance with the Tibetan proposal and more with a false propaganda to create misunderstandings on the issue of Tibet,” he said. Sikyong concluded his address by reassuring the Chinese scholars about His Holiness the Dalai Lama and the Tibetan people’s deep commitment to non-violence to resolve the Tibet issue. The talk was followed by a question/answer session where Sikyong clarified and responded to the doubts and remarks expressed by the scholars. Sikyong Dr. lobsang Sangay shares a close relationship with overseas Chinese intellectuals and scholars as he was among the first Tibetans to reach out to Chinese students and public through organising Sino-Tibetan dialogues in the 1990s, in collaboration with Dr. Yang Jianli. This dialogue is also a part of Sikyong Dr. Lobsang Sangay’s continuous efforts to enhance mutual trust and understanding between the Chinese and the Tibetan people and hopefully a positive solution on the issue of Tibet. The dialogue in progress at Washington DC.